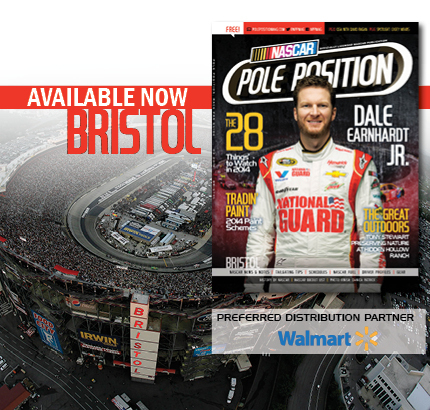 NASCAR Pole Position Bristol edition is now available. Please head to Walmart, or other area retailers that offer free magazines, to pick up your free copy. You can find a list of preferred retailers distributing NASCAR Pole Position in the Bristol area market here. Magazines were shipped to area Food City stores. Be sure to tell them NASCAR Pole Position sent you! And remember the magazine is free for all race fans! If you are not in the race market, you can get a subscription to NASCAR Pole Position here right now. « Previous Article Sprint Cup | Keselowski Sweeps Vegas, Beats Dale Jr.
Next Article » This Week's Edition of ROAR! Now Available for Free Reading!